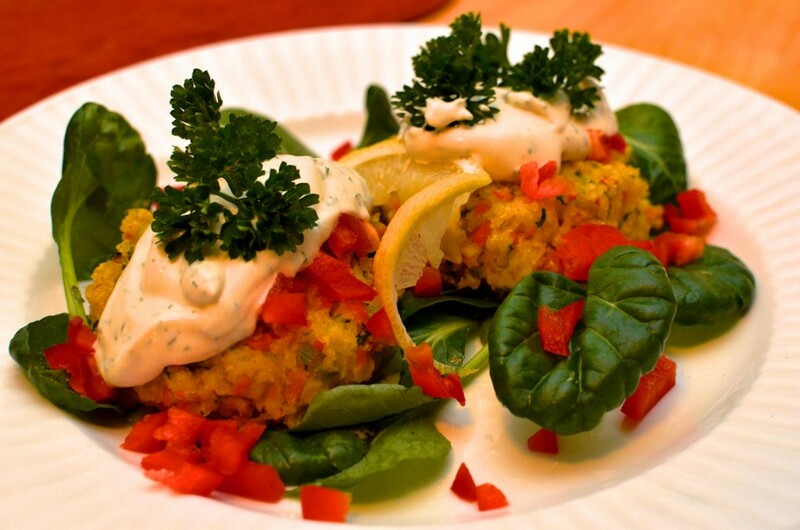 Since moving to Ithaca, we have attended several vegan cooking classes at our local co-op, Greenstar. Our favorite chefs are Priscilla Timberlake and Lewis Freedman, who are well known for their Friday Macro Dinners. They also recently came out with The Great Life Cookbook, featuring amazing vegan and gluten-free meals. I love that the recipes are categorized by month, feature vignettes of friends and guests who frequent their dinners, and is tailored for large gatherings (that can be adjusted for smaller groups). At one of Priscilla and Lewis’ cooking classes, they provided the recipe for a soup that we continue to make again and again. The consistency of this soup is very creamy, despite not having any non-dairy milk or soy products. Chop broccoli into bite size pieces. Set aside the flowers. Water sauté the onions with the broccoli stems for about 5 minutes. Add water and salt, then bring to a boil. Mix in oats reducing heat to a simmer. Cook for 30 minutes. Remove from heat and carefully transfer to a food processor or blender (I used an immersion blender for this step to save me from burning myself with transferring the soup). Blend until smooth. Return the smooth oat mixture to pot. Bring to a low boil, then add the broccoli flowers. Simmer for 5 minutes, until the broccoli florets are bright green. 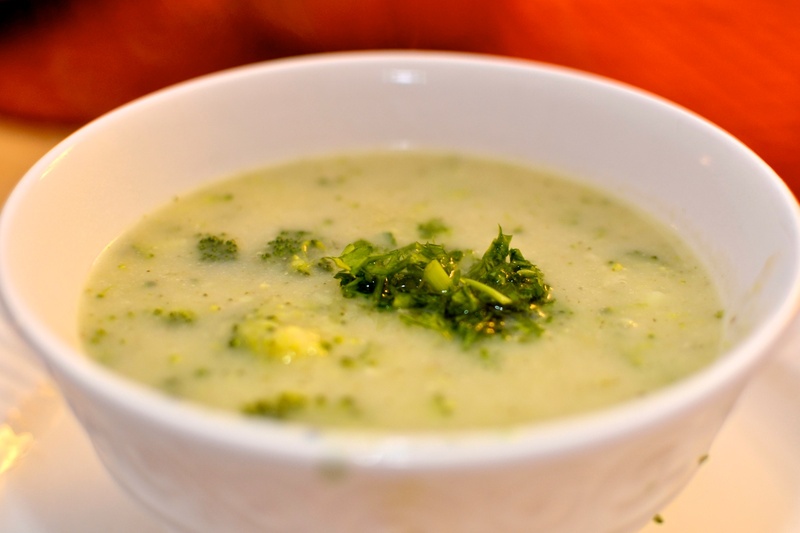 We’d rate the cream of broccoli soup a solid 4 1/2 out of 5 carrots on the veganlicious scale. To round out the meal, we served it with a hearty wheat bread from Ithaca Bakery, a mixed green salad (not pictured), and delicata squash from Darya Pino of Summer Tomato. I have never prepared delicata squash in such a simple way before, but it was so creamy, sweet and provided a nice balance to the soup and bread. 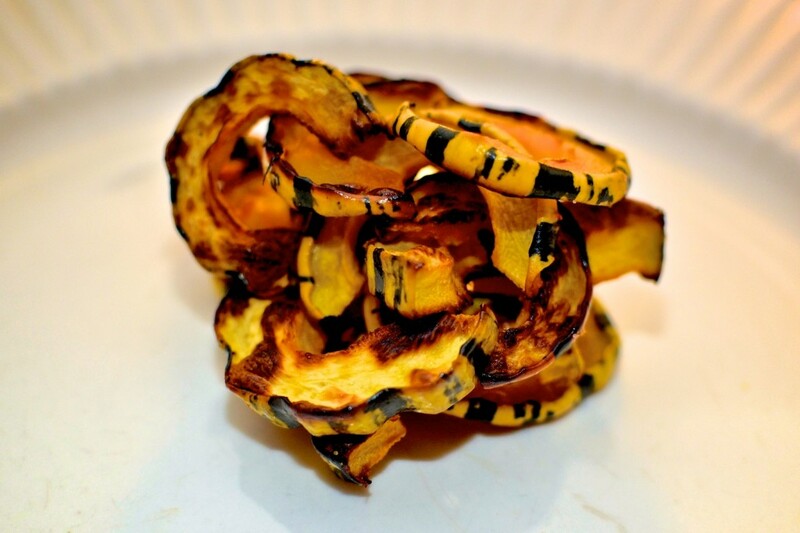 We’d rate the delicata squash 5 out of 5 carrots on the veganlicious scale. In lieu of store-bought candies for our Halloween Bash this year, I decided to go the homemade route and make chocolate lollipops and peanut butter cups. I got inspiration when shopping at A.C. Moore for some last minute party items. On our way out, we saw one of the workers making chocolate scarecrows and severed fingers. I quickly ran back inside and grabbed the last bat and ghost candy molds they had. 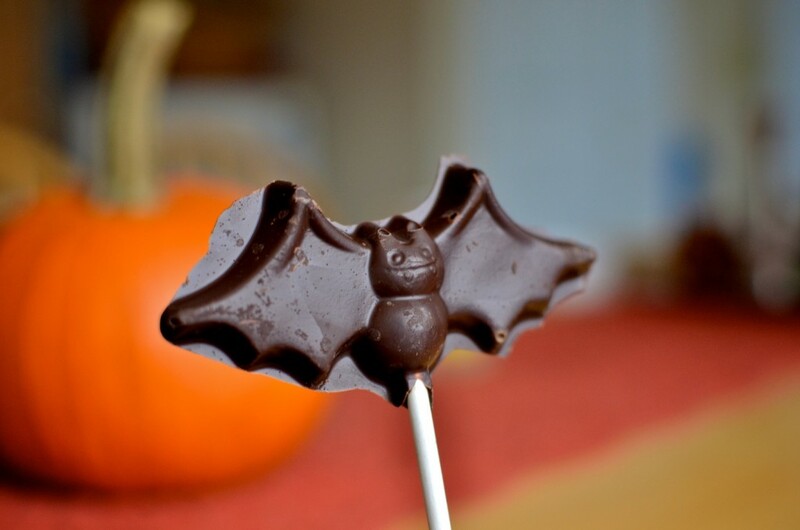 I used my favorite vegan semi-sweet mini chocolate chips from Enjoy Life that I melted in a double boiler and then dolloped into the bat molds with a spoon. 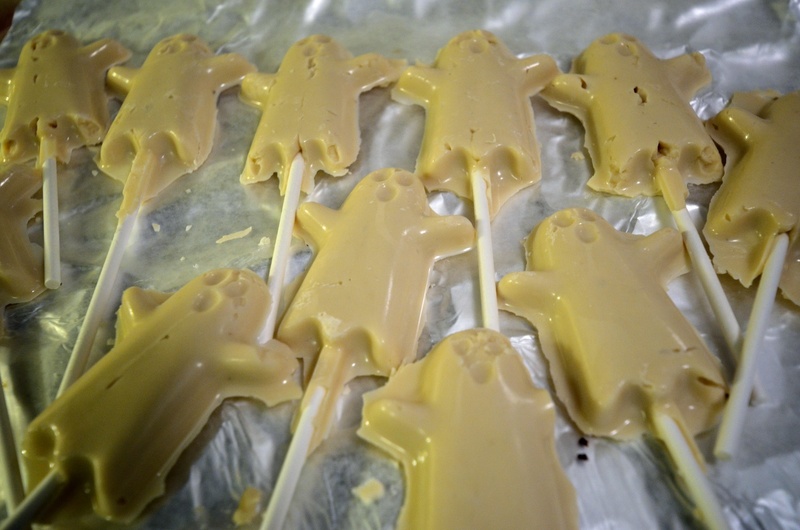 Making the white chocolate ghosts was a bit more challenging. I bought Oppenheimer vegan white chocolate chips, which are kosher and from Israel. They didn’t quite melt in the same consistency as the semi-sweet chocolate chips, but in the end, they got the job done. I’m not a huge fan of white chocolate, but it was the perfect option for ghost lollipops! For the peanut butter cups, I made from my favorite recipe from All American Vegan by Jennifer and Nathan Winograd. Check out my past blog post for pictures and details. Needless to say, the chocolate bats, ghosts, and peanut butter cups were a huge success! Usually, with store-bought candy, we end up with so much left at the end of the night. 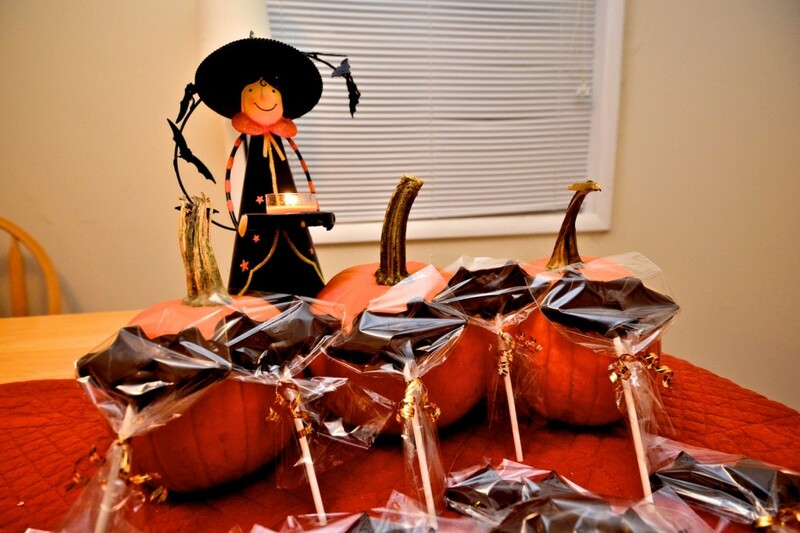 With these treats, many felt compelled to take some with them or just eat them on the spot. We were left with 3 lonely bats at the end of the night which were quickly devoured in less than 24 hours. I think I have found my new love: candy making! For my homework for the vegan chef culinary program at the Natural Kitchen Cooking School, I am supposed to make one recipe per week (between our monthly classes) that is decided upon by the class based on recipes given to us. Since I knew I would be in a pinch for time this week, I decided to make 3 of the recipes all in one night as part of a three course meal. We started off with millet croquettes that included a nice blend of celery, carrots, and onions. The croquettes were topped with a tangy and utterly delicious creamy vegan dill sauce, that I could honestly eat by itself! 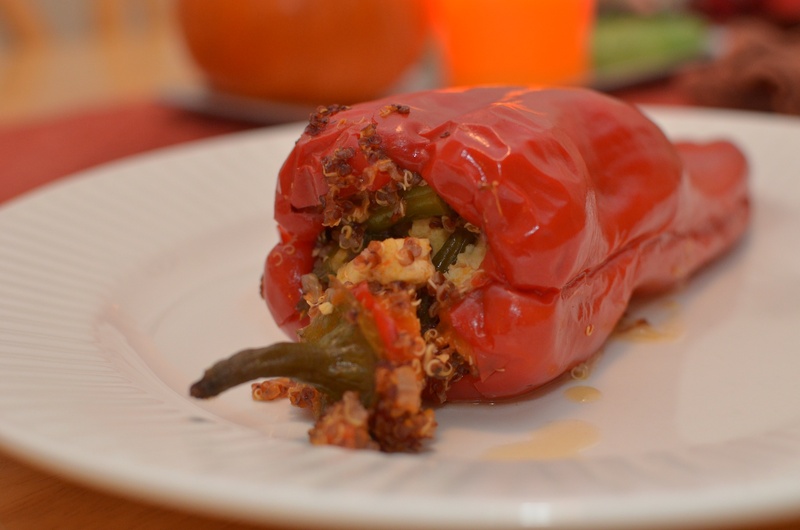 This dish was garnished with red pepper, parsley, and a lemon slice. Decadent! 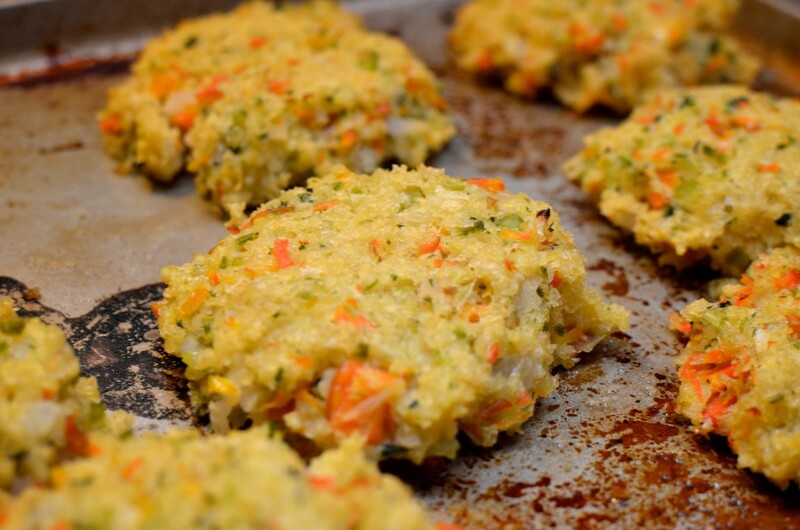 We’d rate the millet croquettes a solid 3 1/2 out of 5 carrots on the veganlicious scale! The next course (at least in the order that I ate them!) 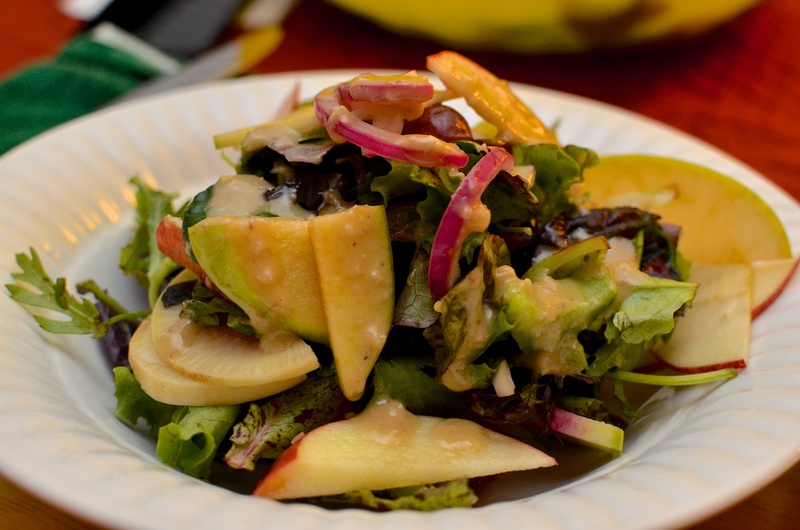 was a lovely autumn salad with walnut vinaigrette. 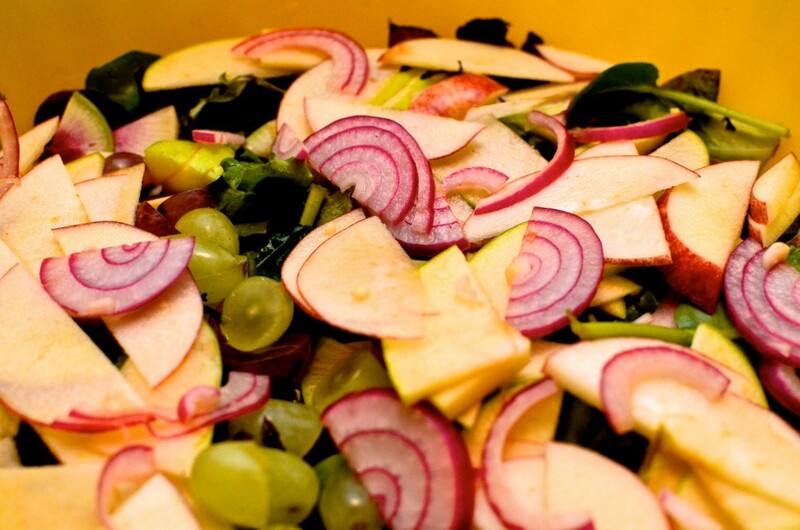 This salad combined a host of fruits (apples and grapes) and hearty fall time vegetables such as radishes and celery. The dressing, like the previous dish, was amazing and really made this salad shine. It was so delicious, we decided to have it two nights in a row! The salad rated 4 out of 5 carrots on the veganlicious scale. For our final course, we had the vanilla scented quinoa pudding with apple compote and candied walnuts. This was my husband’s favorite part of the meal. 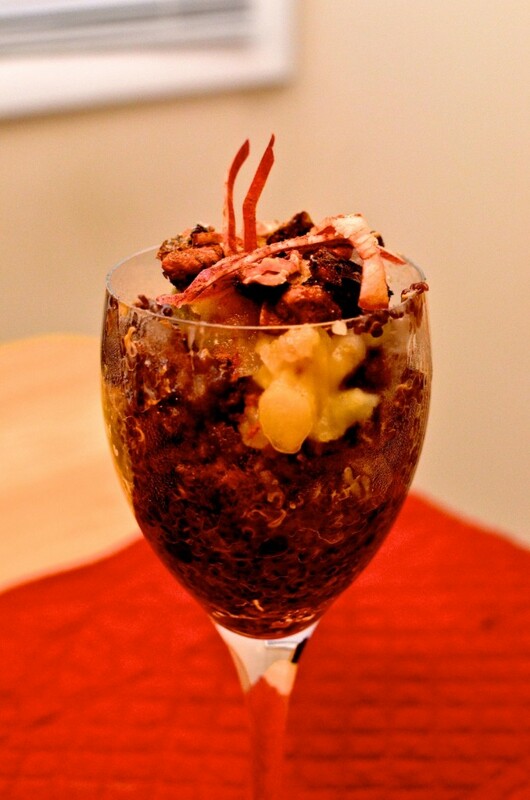 We love red quinoa and eat it on a regular basis, but never thought to make a dessert out of it! We served it warm in wine glasses and topped it with a chiffonade of raw apple skin (courtesy of NKCS’s recommendation). The blending of warm and sweet, with the different textures of the pudding, nuts, and fresh apple skins was unbeatable. This dessert is definitely one to impress guests. We’d rate the quinoa pudding 5 out of 5 carrots on the veganlicious scale! Collectively, the entire meal rates 4 out of 5 carrots. Great holiday meal idea as well! One night in the not-too-distant past, I asked my husband to make dinner. He was on his own completely to make something using the ingredients in our refrigerator from our CSA that week. 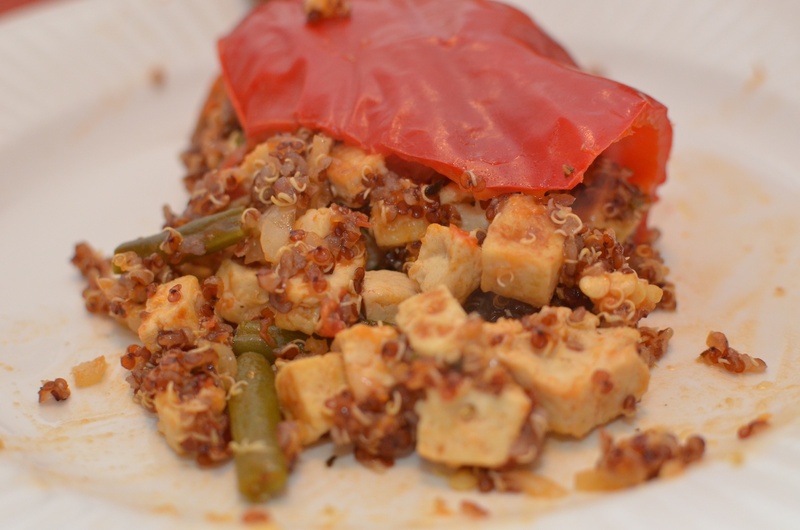 He came up with a menu of quinoa tofu stuffed peppers from the Savvy Vegetarian and this simple corn off the cob with tomato & basil salad from the NY Times. Not only was I pleasantly surprised by the creativity, but I was also impressed with the great taste and mouth feel of these dishes. 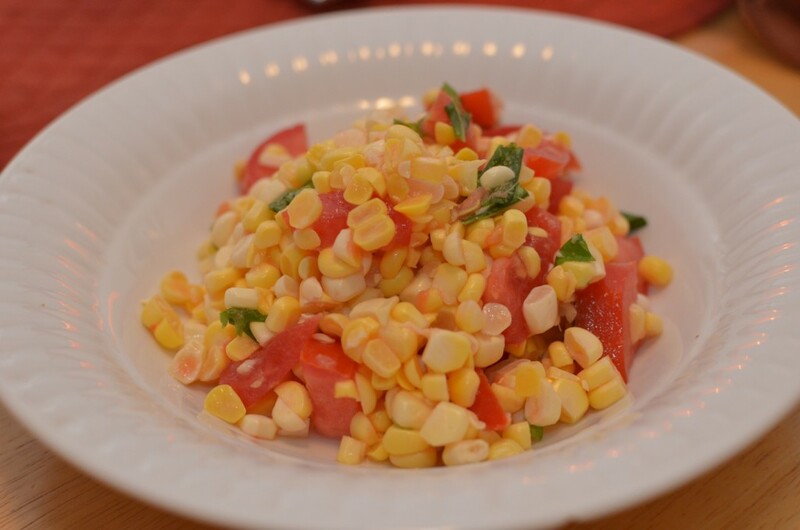 I have never thought to have corn, fresh from the cob, as its own base for a salad. 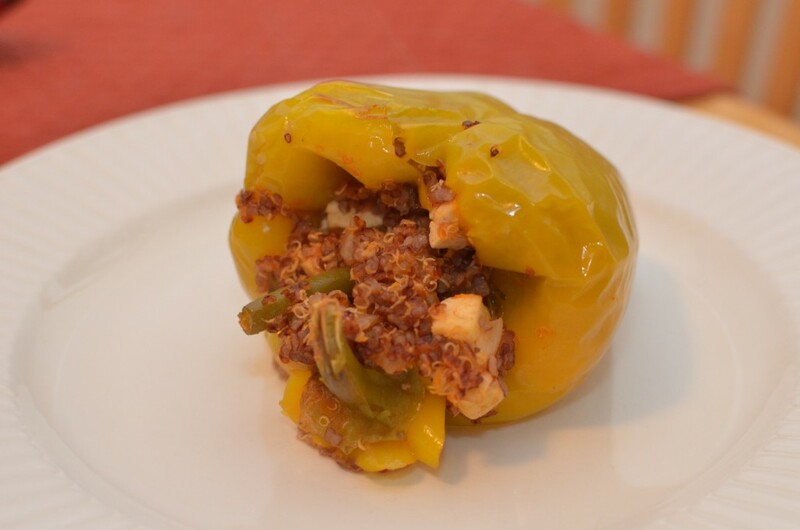 I also rarely think to stuff peppers, but am always grateful for a creative, meatless stuffed pepper dish. My husband liked both of these dishes but really loved the corn off the cob salad! He rated the salad a strong 4 1/2 carrots and the stuffed peppers around 3 1/2 carrots. The overall rating for this meal is 4 out of 5 carrots on the veganlicious scale! 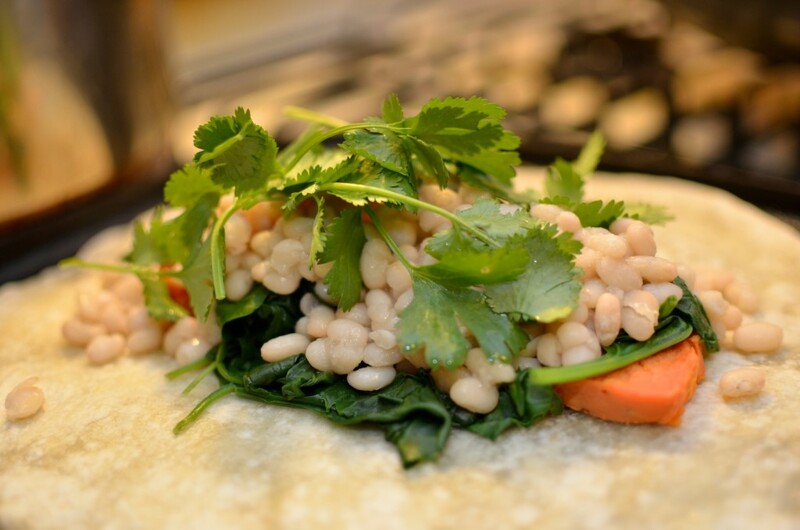 Wanting a quick, but tasty and healthy dinner one night, I decided to throw together some white beans, sauteed spinach, and sweet potato with some garnishes and sauces and came up with this creation. It was a wonderful combination and the cilantro, salsas, and sour cream helped to finish out the flavors. 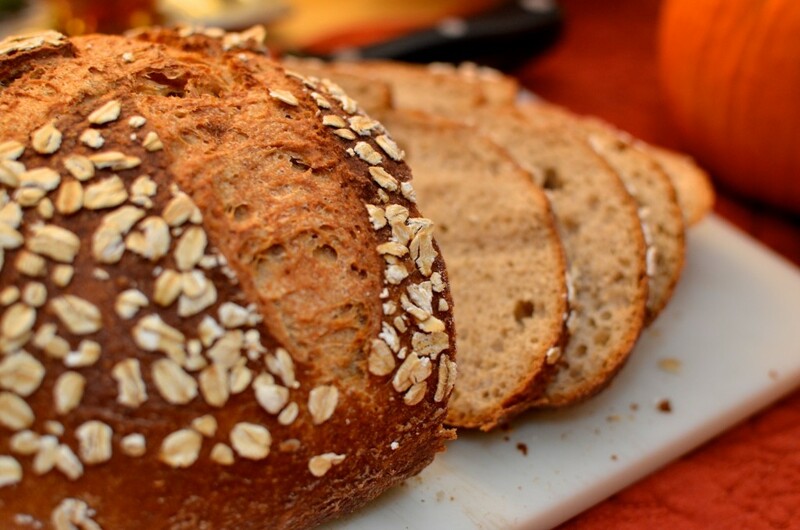 This can be made with any variety of cooked white beans. I used navy beans in this recipe but cannellini beans work nice as well. 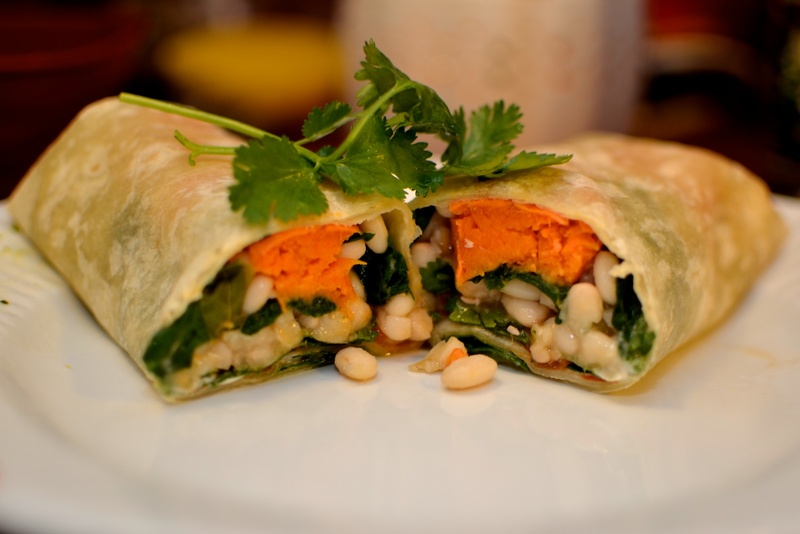 Warm your tortillas and add the spinach, white beans, and sweet potato slices. 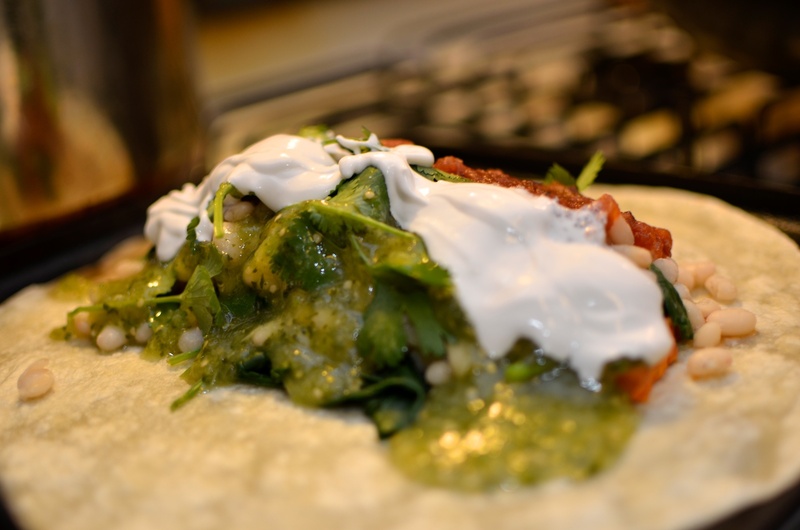 Add cilantro, sour cream, and salsas and wrap tightly. Garnish the top with cilantro and serve immediately.